Motivation on the move now has a new place…right HERE! Listen to your favourite rants anytime, anywhere for bite-sized pieces of hard hitting advice, tips and endless inspiration. These bad boys are sure to set your day on fire! In this ep we talk a variety of things; getting a job VS. staying in business, not getting upset at what people say, the real secret to making money on Social media and the #1 tool for Sales. Ever wondered what billionaires know that the rest of us don't? Also, powerful conversation in this #HeyKerwin ep about creating a strong relationship with your kid when you haven't necessarily had the best start. I share things I've never shared before in this #HeyKerwin episode recorded live with questions from our K2 Elite audience. Every now and then we run a #HeyKerwin LIVE with our K2 Elite audience, this time from downtown LA. This episode is gold for anyone who is curious about launching a podcast, we also discuss whether or not Facebook is dead, and the liability of employees wanting to be irreplaceable. On this ep of #HeyKerwin we talk caring about what other people think, overwhelm, procrastination, and the two things I look for when hiring talent. In this lightning round episode of #HeyKerwin we cover; Advice for 27yr olds, my 3 most important habits, mental health books, and other abstract insights into my brain. If you're juggling a relationship AND a business this ep of #HeyKerwin is for you. We talk about how to raise your self-awareness, and the many benefits of intermittent fasting. If you've ever wondered what the strangest thing I've manifested is, my thoughts on the world cup, or which is my favourite podcast-- this LIVE K2 lightning round of #HeyKerwin is for you. #HeyKerwin 37 is here and we talk dealing with the unexpected, the best way to change your mindset, the highest level of responsibility, and I question whether or not entrepreneurship is for you? We go back to our LIVE K2 audience once again in this #HeyKerwin Ep, and cover the topics: Pricing and sales made easy through branding, how I deal with haters, secrets to having enough energy for family, and finally how to spend less time with toxic people. We cover a wide range of topics in this Ep 35 of #HeyKerwin. Everything from what I do in my spare time and when to scale your business, to letting go of the past and embracing your new identity. How to strengthen your intuition in all scenarios by managing fear, emotions, pain and stress…these hacks are what you want to implement asap to constantly stay in tune. Do this and you’ll unlock some serious sh**. We take #HeyKerwin to our live K2 audience where I breakdown my intermittent fasting regime, talk about how to overcome the fear of getting what you want, plus how to not let other people’s success hold you back. Why it’s not up to you to enlighten anyone... and is it possible to overcome shyness? Also how to prove the haters wrong when people underestimate you. In this Ep we discuss hacking ADHD, how to find your path when feeling lost and how to best learn something new. My best one yet! This week on the show we look at 4 ways to fund your business and some of the mistakes people make when getting investors. Plus, how to choose the right business based on what you’re passionate about AND how you should deal with tough conversations when they come up. In this episode I also give you a look into the habits and rituals I do to maintain peak performance. Got something on your mind? Get your questions in on Facebook, Instagram, LinkedIn and Twitter using the hashtag #HeyKerwin. This #HeyKerwin is the most valuable episode we have produced so far… This week on the show we cover off how to achieve genuine contentment. Plus, how to deal with confusion and using social media for service-based businesses. DON’T FORGET: Get your questions in on Facebook, Instagram, LinkedIn and Twitter using the hashtag #HeyKerwin and then listen in to see if your question gets answered. It all happens here on #HeyKerwin. Why do we care so much about what other people think? The answer is probably a lot deeper than you realise. Plus we talk about motivation, and why some people have more levels of motivation than others. And did you know I have a shark?? In this episode, we get personal. If you want to pick my brain, get your questions in on Facebook, Instagram, LinkedIn and Twitter using the hashtag #HeyKerwin. You ask, I answer – it all happens here, on #HeyKerwin. Another #HeyKerwin LIGHTNING ROUND! My favourite part of leadership, who’s inspiring the sh** out of me right now, and if I had to choose between Gary Vee and Tony Robbins, who would it be? This is the most value regarding branding I've published in a video. We also talk vacations and the return of investment of social media. Another #HeyKerwin, another LIGHTNING ROUND! A lot of truths are revealed in this episode, including my first kiss, my biggest inspiration, and current greatest challenge. Death is guaranteed, so what is the benefit of it? How to help someone with ADHD, my strategy for dealing with overwhelm, and why I love when my son is in pain. You won’t want to miss this one! In this episode of #HeyKerwin we discuss the characteristics and benefits of high-performers, the connection between video games and discipline, what a strong herd looks like, and controlling your addiction. In this episode of #HeyKerwin we dive into self-sabotage, I tell you about my schedule, we discuss the correlation between desires and suffering, how to fire a team member in a positive way, and tackle commercialising your purpose. On this episode of #HeyKerwin I reveal my favourite quote, word, and time of day... and it's about time we make penguins illegal. The concept of leading up the chain, the flaws of the school system, the most impactful wake-up call of my life, with great responsibility comes great power, benefits of planning, rewarding results or effort? In Ep 21 we talk about being driven by PURPOSE in order to achieve FREEDOM, also how to remove toxic people from your life, why Podcasts are becoming more popular, and a surprise at the end. More Lightning Round, and LOVING IT! Childhood trauma, the hardest decision so far, feng shui and FOOD! In this episode of #HeyKerwin we talk about how to create and manage a healthy culture, how I plan and control my schedule, how we handle conflicts in the team, and how to find your baseline. And of course, I want to know.. what is your trigger for stress? Lightning round is back! How often should you cry, and is love at first sight even real? In this Ep we talk different ways of relaxing, giving advice for creatives getting in business, how to get people to want to work with you and dealing with the poison we call regret. Ep 15 of #HeyKerwin where we launch a NEW format called lightening round! 30 Questions answered in less than 5 mins flat! You will learn more about me personally in the next 5 minutes than you will from watching all my videos.. THIS IS AWESOME!!! I answer your questions on Achieving mastery, does our purpose change? Keys to recruiting the right people, putting yourself out on social and dealing with struggle. In Ep 12 we talk about managing emotions, controlling circumstance, gut based decision making, whether taking a side job is cheating, choosing the right business partner.. AND how to stand out on social media! KAPOW!! In this ep we go DEEP and WIDE on all things sales and selling and how to become a power influencer when moving your product or service and how and why my morning routine give me the power I need to outwork almost everyone. On Ep 10 we chat about money, meditation mantras, expectations, and staying hungry… This might be the kick in the balls you are looking for. Episode 4 is HERE! I start the conversation off by chatting about some common themes I’ve noticed around fear….and it has nothing to do with spiders or being scared of the dark. Also on the show, I reveal how I’ve harnessed dyslexia and ADHD into a game-changing super power… AND we talk about negativity! Specifically, how to change someone’s negative mindset, what you should do if you have a negative boss and how you can use open and honest communication to get your message across effectively. Plus, how good are you at negotiating for a pay rise? One listener needs some help for an upcoming pay review. Oh and we chat about marketing in tourism. This is a jam packed podcast! DON’T FORGET: Get your questions in on Facebook, Instagram, LinkedIn and Twitter using the hashtag #HeyKerwin and then listen in to see if your question gets answered. It all happens here on #HeyKerwin. 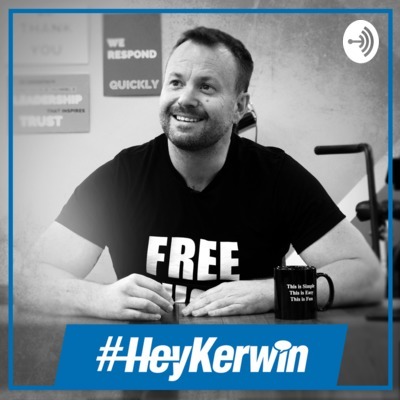 Welcome to episode 3 of the #HeyKerwin podcast where I answer YOUR questions on business, life, relationships and more. On this episode I get asked how to start a business while still studying, what’s the best process to overcome nerves, and what to do once you’ve discovered your purpose? Also, we chat about how to prepare for business and why it’s just like preparing for a marathon. Plus, I reveal exactly how we come up with our content and why it’s probably a lot simpler that you think. Big questions and even bigger answers! All that and MORE on episode 3 of the #HeyKerwin show. This is the show where we dive into your burning questions, deepest desires and curious concepts. Got something on your mind? Get your questions in on Facebook, Instagram, LinkedIn and Twitter using the hashtag #HeyKerwin. I’d love to hear from you. Oh, and if you liked the show share it with a friend! #HeyKerwin 02 - Is cut out to be an entrepreneur? Ask me and I’ll answer! Welcome to the second episode of #HeyKerwin - the show where we dive deep into your burning questions, deepest desires and curious concepts. On this episode, I get asked if everyone is cut out to be an entrepreneur… the answer might surprise you. Plus how to stay passionate when the going gets tough and hustle is harder than ever? I also give you my insight on marketing strategies and cover off how to get family members on board and manage narcissistic personalities. And the million dollar question! Someone asks what my thoughts are about opening their business to investors or shareholders verses getting a business loan… you’re going to want to get out your notepad for this one. All that and MORE on episode 2 of the #HeyKerwin show. Got something on your mind? Get your questions in on Facebook, Instagram, LinkedIn and Twitter using the hashtag #HeyKerwin.